For those architects with an interest in theater, Wednesday was the West Coast premiere of Oren Safdie's newest play, False Solution, at the Santa Monica Playhouse (tickets may be purchased here). Safdie earned an M.Arch at Columbia University and is the son of architect Moshe Safdie. He has now written three plays inspired by contemporary architecture, including The Bilbao Effect and Private Jokes, Public Spaces. False Solution, which also played in New York last summer, follows Anton Seligman, a successful architect whose latest commission, a new Holocaust museum in Poland, is aggressively challenged by one of his new interns, Linda Johansson. She also confronts his beliefs in himself, his career, his profession, and much more. On May 1, AN will host a panel discussion at the Santa Monica Playhouse moderated by West Coast Editor Sam Lubell. Panelists include Safdie, the show's stars Daniel J. Travanti and Amanda Saunders, and architects Craig Hodgetts and Hagy Belzberg. False Solution runs through May 11. Last week Lubell sat down with Safdie to discuss the play, its challenges, and the arc of his career. Read the interview below. Sam Lubell: I was talking to one of the actors about how False Solution really has an impact on many levels and holds together well. One thing I noticed was that there are a lot of specifics that come up, and I’m wondering, did you have any real life inspirations for any of these characters or situations? Oren Safdie: It’s an amalgamation in some ways, but obviously there are references that are made that I think more people in the architecture community will get. Not necessary the characters as much as the building referenced in the play. It derives from two different philosophies in two different Holocaust museums that I used as my model—one based on the Jewish Museum by Daniel Libeskind in Berlin and one on my father’s Holocaust museum in Jerusalem. I always noted that they took completely opposite approaches. One being the extreme—trying to express as much as one can in a building about the Holocaust—versus the opposite approach that pretty much eliminates any architectural expression and tries to void the building and allow the exhibit to stand by itself. I try to let these two philosophies bleed into the characters and then create tension between them. It’s not just a subtle allusion. Each one of those is clearly represented. Yes, definitely. You can’t forge the reality. But in terms of the characters, they are parts of different characters. This architect is not based on Libeskind and the young female student is not based on my father. They are just the characters and you just infuse those philosophies into their characters. In many ways it's interesting that the struggles to design a museum reflect the struggles in these characters. Being in the architecture world I don’t often get to see a side of architecture that reflects inner turmoil or inner struggles, so I think that is a very powerful technique. I think where I started from, more than focusing on a Holocaust museum, was focusing on an architect who is at the pinnacle of his career and who is adored by the public and by the press. Yet something within him has doubts—debating if he’s a fraud or not. What would it take for somebody to prick that balloon and let all the air come out? A young, attractive, intelligent first year architecture student certainly is capable of that. Which brings up another interesting aspect of your work: You’re not afraid to pull punches. You’re willing to criticize the profession of architecture. Well I think I’m in a position to do that because I won’t lose any jobs if I do. I think having a foot in architecture and being in architecture school gave me an in-depth knowledge. I never really practiced, but I can sort of do things and not really worry about that. Not to say that people don’t get upset, but for the most part I think people have responded well. But sometimes you read some architecture critics and they can be equal to those theater critics that bring out the knives. Certainly there was a very direct criticism of Libeskind and the sense of making people queasy with architecture. I don’t know that’s the way you feel about it but it was a very specific critique. I don’t know if it was a critique? I put it out there and maybe you see it like that and other people may see that. Hopefully I didn’t make a judgment on it. I think you mentioned once that Frank Gehry was mad at you for a little bit. Well I don’t receive personal phone calls from him, but I heard through the grapevine that he did not like the fact that I used the Bilbao Effect for the title of one of my plays. It was a fictitious look at the Brooklyn shipyard project, but was set in Staten Island. Really it was high satire. It was a court case involving a member of the public who was bringing a lawsuit against the architect because he blamed his wife’s suicide on the architect. It was always a far-fetched scenario. After architecture school, what made you decide to veer off into playwriting? It was pretty instantaneous. In my last semester in architecture school I took a playwriting course, because Columbia encouraged us to take a course outside of Architecture and Art History. I wrote a 10-minute scene based on my experience of juries in architecture school, which became my first architecture play, Private Jokes, Public Places. I guess while other people were really focusing on buildings I was just amazed at the drama that took place during student pin-ups. I didn’t turn back after that. You're not afraid to get technical. Being in this arena and not being an architect, I appreciate that you obviously know the talk. But it’s not to the point that laypeople can’t understand it. Right. If the story doesn’t have an inner tension—in False Solution it’s about this older man and younger woman—then I think you lose them as well. I remember going to see Tom Stoppard, a British playwright, who wrote the Invention of Love. It was all references to something I did not understand. In fact, I probably only understood 50 percent of the play. Yet that play has stayed with me, because the moments in between all the dialogue that I could understand were very heart wrenching and memorable. So I see the technical stuff as background music, and every so often the story is punching through and you’re following that. Obviously the emotions and human drama are the things that hit you the hardest. Hopefully. You do have to follow and you do have to work for it. Its not the kind of play that you’re going to come in and sit back and relax. You have to stay alert and follow these things. It’s a workout for the brain. I have to mention the fact that your father is a very famous architect. Is that something that you struggle with? A pressure to be compared to your father? Well it’s a double-edged sword really, because I sometimes I feel that it’s given me a foot in. Some people might say. "Oh, well I’ll go see this because he’s the son of... maybe there would be something interesting." It’s also worked against me in some ways in which people dismiss me and say, "Well the only reason he’s gotten there is because..." I think getting away from architecture or being a practitioner was probably a healthy thing for me to do. Theater is a world quite far away from architecture, and yet these plays are a way to participate in the debate. 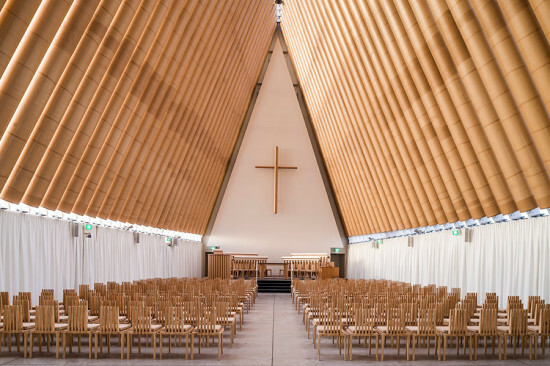 The Pritzker Architecture Prize has named Shigeru Ban its 2014 laureate. AN executive editor Alan G. Brake sat down with Ban at the Metal Shutter Houses, a luxury apartment building he designed in Manhattan’s Chelsea gallery district. He discussed influences from California to Finland, the social role of architecture, and what the recognition means for his work. As a former Pritzker juror did you ever expect to be in the position of being a laureate yourself? Not this soon. Also I know I have not made such achievements yet compared to other laureates, so I was not expecting it at all. You are considerably younger than some of the other laureates; tell me where you see yourself in terms of your career. I knew about the reason why I was chosen, and I knew that the reason was quite different from other laureates. It was an encouragement for me to continue to do the kind of social work as well as making projects like museums and others, so I try to keep a balance between other kinds of projects and working in disaster areas. So I’m taking it as an encouragement rather than the award was for such achievement. How did you first begin working in disaster areas? After I became an architect I was quite disappointed in our profession because we are mainly working for privileged people. Even historically this is the same, because money and power are invisible people with money and power hire architects to make a monument—to visualize their power and money for the public. I thought we could solve more for the public, for society, but it was not so. I thought there was an opportunity for me to use my experience, my knowledge for the difficult situations, like natural disasters—though I must say natural disasters are no longer natural. It’s our responsibility, and there were no architects working in disaster situations, because we are too busy working for the privileged. I’m not saying I’m not interested in making monuments, but, as I said, I wanted to use my knowledge and experience to help the people who lost their houses. And I thought we might make even better temporary housing. So the first time I started working in Rwanda in 1994 after the crisis, I proposed the idea of using cardboard tubes, paper tubes for the shelter construction for the United Nations High Commission on Refugees. I was contracted to develop this idea further. Do you see other architects beginning to work in this field? Especially in the Northern Japan earthquake and tsunami, many architects started working in the disaster area. But when I was working in Kobe in 1995 there was no one. Also, when I give lectures in many different countries, I get a good reaction from younger architects and from students. They are interested in our activities, they want to join us. The situation is changing. Is that something that you feel is part of your role as an architect, to pull the profession more toward social issues or more toward everyday people? Yes, yes, I do. There’s a wonderful sense of invention in your work and every project is approached in a new way. Can you talk about how you begin? Actually, I don’t invent anything new. I always use an existing material in a new way. Paper tubes are not a new material. In this building we have metal shutters. This is an existing material. So I try to use existing materials differently, with more meaning or more function, instead of just inventing something new. It’s also interesting, learning from context, using local materials. And I always look for a problem to solve through design, instead of making some sculpture. How do you approach space or structure, some of the other fundamental aspects of architecture? Even as a student, I hated to be influenced by others. Always there’s a fashionable style, Baroque, or neoclassicism, or postmodernism. I didn’t like being influenced by the fashionable style, the style of the day. But in history I looked at Buckminster Fuller or Frei Otto, they made their own structural system or developed their own materials to make their own kind architecture. I was dreaming as a student to make my own structural system, this is why when I started using the paper tubes, made of recycled cardboard, even concrete buildings can be destroyed by earthquakes, but my buildings made of paper tubes can be permanent. I thought by using weaker materials or humble materials I can make some different type of architecture, taking advantage of the weakness of the material. With steel, it’s very flexible and strong. You can make any shape. With a paper tube, it’s so weak, and you can’t make just any form out of it. You have to find out what is an appropriate way of using it. Louis Kahn used to always ask his students, in his famous lecture, “Mr. Brick, what do you want to be?” And he said, “I want to be an arch.” So with the paper tube, which is a weak material, I have to find an appropriate way of using it. You can’t make everything from paper tubes. It’s not a perfect material. The limitations give me the idea to make an appropriate form out of this kind of material. Looking back on your career thus far, what are the breakthrough buildings for you in terms of developing your thinking about architecture? The Kobe project was kind of an important project for me, in terms of deciding my life’s work on disaster relief work, but I suppose for an architecture style or system, in the earlier period I designed a number of low cost houses, I called them “case study houses.” After I finished high school I came to the U.S. and the first school I went to was Sci-Arc in California. I fell in love with the so-called Case Study Houses, and Schindler, Neutra, Craig Ellwood, and so on. And I felt they had some Japanese influence. Because I didn’t study architecture in Japan, my first kind of Japanese influence came through those Case Study Houses. So in my early period I designed the so-called Curtain Wall House, the Walrus House, the Naked House, the House with a Double Roof. Many of these were low-cost housing with a special way of using an existing material or making a space connect to the inside/outside, so those case study houses helped to make my direction. Because before that I had some influence from Cooper Union, some influence from John Hejduk and the New York Five. But in order to get out from this movement from my school, I started to use the structure and development of materials to establish my own style. So this interest and approach to materials has really been there from the beginning. Yes, yes. Because in the beginning I was working on low-cost houses, I didn’t want to make a cheap house. So working with humble materials I could make something interesting instead of just making a cheap house with a low budget. That’s why I had some ideas of using everyday, low-cost materials differently. You are now the seventh Japanese laureate. That speaks very highly of the culture of architecture in Japan. Can you talk a bit about what you draw from Japanese architecture culture and how you deviate from it? First of all, I don’t know if I should be considered a Japanese architect, because I didn’t go to school in Japan and I’m working every where in the world, and also I’m not part of any school in Japan, and I don’t just mean universities. In Japan there are many schools, the Tange School, for example. And I didn’t work for any Japanese architects, except I worked for Isosaki for one year when I was a student. It was an internship almost. So I’m not part of this society. I didn’t have any public projects. The first opportunity came from France, the Pompidou Centre, and from the U.S., the Aspen Art Museum, and so all of those former Japanese laureates became very famous in Japan, they made public projects and then they started working abroad. But my case is different. Why did you decide to study in the U.S.? When I was in high school, when I was seventeen, I happened to see the Japanese architecture magazine A+U, they had a special feature on John Hejduk and Cooper Union, and I was amazed by his work. So that is why I came to the U.S., without speaking English. But there was no information, no internet, so I had to come to the U.S. to find out that Cooper Union does not accept foreign students. But I found out I could apply as a transfer student, so I had to look for a school I could enter and transfer to Cooper. I happened to find SCI-Arc. It was a brand new school, maybe three years old, founded by Raymond Kappe. It was very exciting how they renovated an old factory into the studio, so I applied, and I was very lucky to be interviewed by Ray Kappe. I didn’t speak English very well and he was very kind to accept me, and then after two and a half years I applied to Cooper Union. What did you do after you graduated? Well, I couldn’t graduate immediately because I had a big fight with Peter Eisenman, and so I had to extend my thesis. But I went back to Japan and began working for a very famous Japanese photographer, Yukio Futagawa, as his assistant. And I went with him to Europe, to visit Alvar Aalto’s projects, which I wasn’t interested in at all at Cooper Union. When I went to Finland to see Aalto it was a big shock to me; his use of local climate, of materials, his craftsmanship. Also, I organized an Aalto exhibition in Japan—and that was when I began working with paper tubes, because wood was too expensive. What was it that was so eye opening? The Villa Mairea. It’s in harmony with the climate, the context, and it takes advantage of many different kinds of warm materials, and also light. The light was so beautiful. But you know, in the International Style context was not so important nor was using natural materials, so Aalto’s was a completely different kind of architecture. How did you get your first project? After I finished at Cooper Union I wanted to go to graduate school in the U.S., but my mother asked me to design a small building for her boutique, so I decided to go back to Japan just to finish my mother’s building before coming back to the U.S., but I also organized three exhibitions, including the one on Alvar Aalto, which was brought from MoMA. And while I was doing these exhibition designs and working on the building for my mother, I started working on a small villa project and I became too busy, so I gave up coming back to the U.S. Also, it’s interesting in Japan, Japan is the only country, where even the middle class people hire architects to design even a small house. In a developing country or in a developed country, rich people hire architects to design big houses, but in Japan there is so much opportunity for young architects to design small houses. That’s really great training for us. Obviously your interest in disaster relief housing has been very important to you and very important to architecture. What are some other areas where architects should be doing more? I think in education. Many famous architects don’t teach, but I think teaching is very important. For me I had Raymond Kappe, Tod Williams, Ricardo Scofidio, Diana Agrest, Bernard Tschumi, John Hejduk. It was an incredible experience. And I can’t give them anything back, the only thing I can do is give the same thing to the younger generation. If I didn’t have great professors, I wouldn’t be here. At Cosentino’s launch of Dekton, AN had an opportunity to sit down with Daniel Libeskind. The world-renowned architect designed an outdoor sculpture, Off the Wall, made from the new material that weathers like stone but has manufactured advantages of specialized color, texture, and form, thanks to Cosentino’s particle sintering technology (PST) that simulates metamorphic rock formation at a highly accelerated rate. 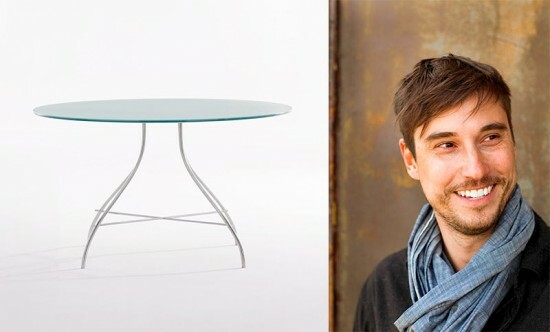 It originally debuted this spring at Salone del Mobile in Milan. AN: You studied music in Israel. Do you find any of your classical music training to inform your design and architecture work? 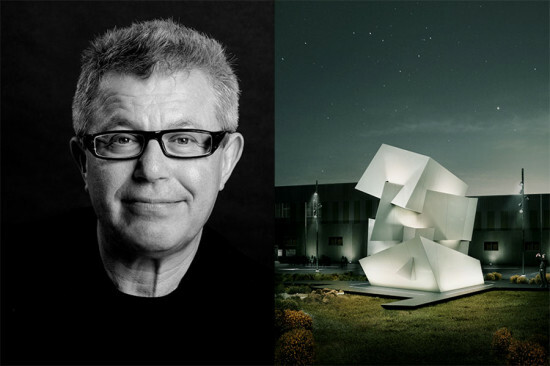 Daniel Libeskind: Totally. Even though I was a virtuoso performer I continue to use that sense of my relationship to music very deeply in my work. Architecture and music are closely related in many ways. They’re both very precise: In music, even a vibration cannot be off by a single half note. And it’s the same with architecture; the geometry, the spatial character of a building must be accurate. And in the end, they’re very similar in the sense that despite their scientific basis and precision, they have to register emotionally. In other words, we don’t think about the music, or an atmosphere that affects us spiritually. From the way a score is written and has to be performed by an orchestra, an architect doesn’t build his building. Sometimes he is not apparently there; the architect is more like a conductor of a concerto. It’s full of closeness for me. To continue the musical analogy, would you say the style of your work is more traditional and evenly phrased like Mozart, or neoclassically experimental like Stravinsky? Music to me is not really in categories of classical or rap or rock or medieval or Gregorian. Really, it’s a universal language of rhythm, sound, and tempo. I would say each of my projects has its own musical quality. Acoustics themselves are so important in my work. In the Jewish Museum in Berlin, I designed an entire void for the acoustics. And let’s not also forget that our sense of balance isn’t in our eye but in our inner ear. All of these things converge on my set of interests. What are your impressions of the acoustic and/or technical qualities of Dekton? I think Dekton is a great material. 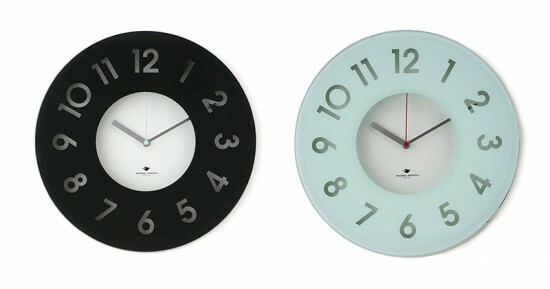 First, it’s not just reusing old materials. It brings qualities of porcelain, glass, and quartz together through a new technique of creating the material. Which I think has a lot of incredible characteristics, both acoustical, visual, and also tactile. The sculpture you designed in Dekton for Cosentino has a spiral quality with intersecting corners that suggest an indoor/outdoor application. It’s a spiral, that organically grows but also uses the tectonic means of planes to ascend through movement toward light. Each face has a different quality of light and movement because of where it’s placed, so it is a sculpture but its also an architectural microcosm that suggests an ability to create spaces that are really fluid and very tectonic. Any ideal applications for Dekton, not just for your practice but for architects in general? I think in large-scale walls—because, you know, architecture contains walls—to create a beautiful sense of light and resilience with the material. It has great technical qualities—rigidity and imperviousness to water—and also aesthetically in terms of color, texture, and materiality. And for exteriors, because I’m working on buildings in mega scales, I think it’s a very good material because if you think of other cladding materials, you can’t really compete with this technical ability. The interior/exterior possibilities are also exceptional. Most of my buildings have a sculptural form. 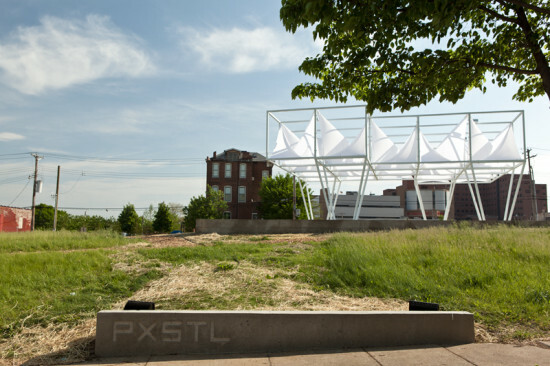 They’re never just a box; they’re spatial forms that most often have never been seen before. In that sense, the question of inside/outside is very important because in my work there’s no division like a cube where its very clear. Those buildings, like that spiral I’ve created for Cosentino, are both inside and outside simultaneously. It can be used in floors that merge into walls that merge into soffits and Dekton can achieve that seamlessly in large scales. Do you foresee Dekton playing a role in any of your future projects? Oh definitely. We’re working on a number of large-scale building projects around the world and I’m determined to use it because I love the material. For example we have a very large project in Sao Paolo that hasn’t been made public yet. We also have some creative opportunities in China and Singapore. Back to music, do you have a favorite band or album you’re currently listening to? I’m from the era of CDs—not records!—but not yet MP3s. On my table lays music that spans millennia: ancient Greece, the latest rap recordings, Helmut Lachenmann, one of the great composers from Germany. Music is always fantastic. 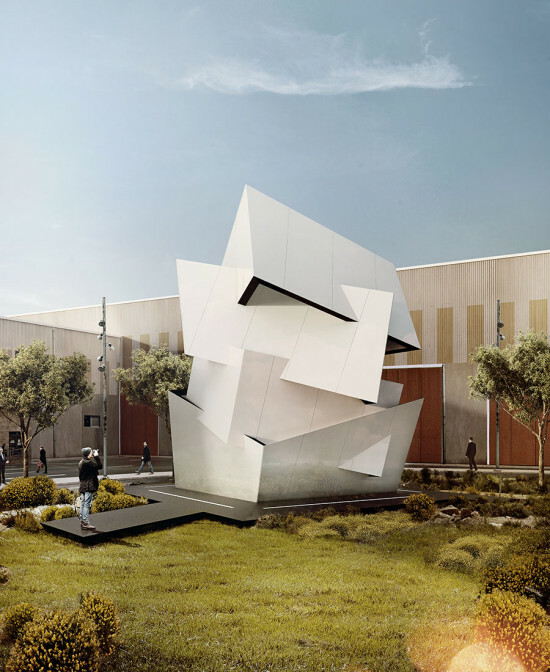 A model of Libeskind's Off the Wall is on view at the Center for Architecture in New York, as part of the Surface Innovation exhibition that runs through the end of October. At the NeoCon contract furnishings trade show in June, AN executive editor Alan G. Brake sat down with Todd Oldham to discuss the collection of wall coverings he developed for Designtex adapting the work of Charley Harper. 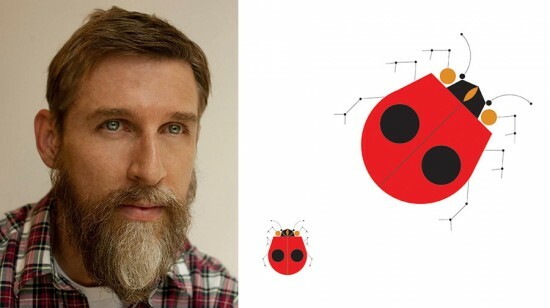 Harper is arguably best known as an illustrator, but Oldham is working with the Charley Harper Studio to broaden Harper’s reputation and create new products using his menagerie of images of flora and fauna. A versatile designer of fashion, home furnishings, books, and objects, Oldham has a special interest in reviving midcentury designers and he previously worked with the Alexander Girard archive. AN: Tell us about your interest in Charley Harper. Todd Oldham: I had the great pleasure of knowing Mr. Harper for the last five years of his life. He was an amazing, magical man. I came to know his work when I was a kid. He did the illustrations for a book called the Golden Book of Biology, which was my biology text book in school. I loved it. So many years later I reconnected things and found him and forced my way in—he was very gracious about it So you were a design stalker. Yes, I was a design stalker. I don’t do that very often, but I’m in awe of Charley. It’s a dangerous thing to meet your heroes, but not in this case. It was wonderful. What about his work drew you to him, beginning all those years ago? The things that drew me to his work when I was five are the same things that I love now, which is his ability to communicate complex information to the most…I don’t want to say simplest form because that suggests it’s diminished, which it’s not…he was able to boil something down to the zeitgeist and never lose one morsel of it. It’s really something. How did the collection come together? Well, Susan Lyons is now the big cheese over here at Designtex, and I’d worked with her before on a project on Alexander Girard when she was at HermanMiller, so when this opportunity came up, we always wanted to try to find a partner to bring his work to life in a new way. We’re very excited about this opportunity. We are always true to Charley’s designs. A lot of times when you are working with other designers, the Eames or Girard, you have a lot of objects you can bring forward. In Charley’s case, he was an artist, so you only have flat things, so making him live in the world in another way, you have to make sure they still represent Charley and what he was about. This medium with Designtex was just perfect. We’re sitting here by the ladybugs, and ladybugs were always very dear to Charley, I think because of their graphic quality. In the early 1970s a Chinese beetle came over—and was known as the orange ladybug—it became a garden pest, Charley was very upset because his beloved creature was being maligned, so he always said, these are the bugs that bug no one, so the ladybug was always very near and dear to him. This was actually painted on the outside of his house in the early 60s and it remained there until weather took it off. It was replaced in the early 1990s. The mosaic that we walked past is an exact replica of the one that was done in the federal building in Cincinnati. It done was in one inch tiles, either whole tiles or bifurcated, and sometimes you’ll see the extensions—either the legs or antennae—were done in glass or plexi-glass inserted into the grout. In a repeatable image it had to be moved around a little bit, but all the colors, all the forms, the scale are all exact. Why was Designtex the right company to make these wall coverings? They’re coming at it from the right place, a very thoughtful place. They’re also trying to make the most conscious decisions about the manufacturing that they can. Charley was an early ecologist. He did amazing bumper stickers in the late 60s that said, “You otter care about water,” and it had a little otter on it. These things were very important for him. Since we represent the estate, going against what was important to him would be blasphemous. Are there other treasures in the estate that will have other lives in future collections? With Charley, they’re all treasures. There is no bad work, no off work. It’s just stunning throughout. Our biggest obstacle was editing it down. I like where we landed with this project, but this is just a sneak preview of what’s to come. This tile-based mural is one of my favorites. It’s very unusual that it’s in a Federal Building. It’s not easy to get access, so I begged and begged for hours. It’s a in a public space but in a building you can’t get into. It’s amazing. It’s over 50 feet of non-repeating images. There’s another that’s based on Charley’s representation of birch bark. Charley had this amazing sort of cubist take on birch bark. That reminds me of your work. My color scheme has been fully informed by Charley, way before I ever knew why. I like those odd colors, the printing techniques. We’re really excited to be debuting with these wall coverings, which are durable enough for healthcare applications. Wouldn’t it be nice to be recovering and wakeup under one of Charley’s ladybugs? Do you have any other archival projects in the works, after Girard and Harper? I do, but I can’t talk about it yet. It’s not a designer, it’s a photographer. But I can’t say just yet. 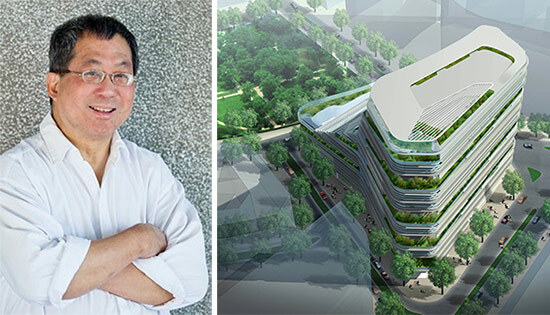 This is second of a two part interview of Ken Yeang one of the earliest thinkers and designers in the field of sustainable architecture. The interview was conducted by Mic Patterson of Enclos who will be introducing Yeang at The Architect’s Newspaper’s Facades+PERFORMANCE conference on July 11 in San Francisco. Mic Patterson: Your work clearly demonstrates that concepts of bioclimatic design are readily scalable from the residence to the skyscraper to the urban environment. How do the considerations of bioclimatic design apply at the scale of building subassembly or the the building skin? Ken Yeang: At the sub-assembly level, we have developed devices such as the 'raincheck' wall being a glazing façade system that lets in ventilation but keeps out rain. Another device we are working on is a 'solar chimney' that uses a double-glazed glass-shaft to naturally ventilate internal spaces. MP: Many of your designs include an expansive use of glass, often a challenge with respect to solar control and energy performance. What are the considerations for glass use in your bioclimatic design process. KY: It sounds facile, but giving joy and happiness to occupants is an essential aspect of why we are architects. Much of our work is about "enabling users' dreams come true" by design. One way to give spaces a feeling of cheerfulness is the enabling the simple enjoyment of daylight as it enters a space or as it brightens up a space in the morning – which the use of glass combined with façade design and roof-light devices can achieve. In addition solar control can be achieved with various solar shading systems. Enhanced energy performance can be mitigate using double glazing or 'low-e' glass.Finally we cannot overlook the opportunity to look out from the inside, to create vistas are aspects that glass enables. MP: What are the predominant drivers of your design process beyond climate and ecology? KY: Our overarching objective to advance the field of ecodesign and ecomasterplanning. The first driver is a committed pursuit of innovation and invention in the advancement of this field of endeavour. Discovering a new idea (the 'eureka' moment) is the buzz in what we do. We see innovation not just at the level of 'product' but at 'processes' (the way things are done) and at the level of 'premises' (the principles or theory of why things are done). Everyday in every project, we are searching for ways to innovate. This can be achieved at various levels and at product, process and premises (e.g. at the level of architecture, at the level of urban design and master planning, at the macro level of economics, business and industry, at the micro level of subassembly, etc.). The second driver is aesthetics being the pursuit of an 'ecoaesthetic' – essentially asking, "what does an ecodesign or ecoarchitecure or an ecomasterplan look like?" I believe that ecodesign deserves its own aesthetic that It should look like a 'living system'. We are always asking ourselves, what should a 'constructed ecosystem' look like? 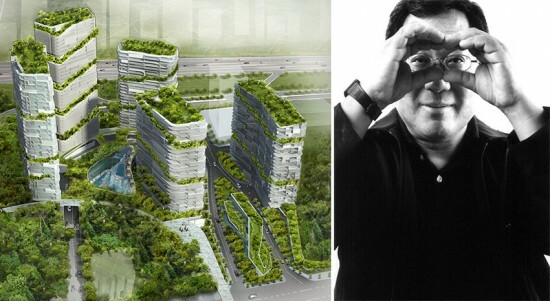 Ken Yeang is an architect and was an early theorist of green architecture. In England, where he was educated at the AA (completing a diploma under Peter Cook) and Cambridge where he earned a PhD in ecological planning and design, Yeang is celebrated as a founder of the sustainable architecture movement. In 1995 he published his major theoretical work Designing with Nature that evolved out his Cambridge thesis and it is one of the first texts on ecological architecture. At the The Architect’s Newspaper’s Facades+PERFORMANCE conference on July 11, Yeang will lecture in the US for the first time at the University of California San Francisco in Mission Bay. Yeang recently answered a series of questions posed by Mic Patterson of Enclos who will introduce him in San Francisco. Here is part one of the interview, the second half will appear tomorrow on the AN Blog. Mic Patterson Your early theoretical work, and ultimately your built work, anticipated the sustainable development that is finally beginning to emerge at a broader scale: climatic design, green walls and vertical gardens, sky courts, biomimicry, solar geometry as a form generator. Why has the adoption of these concepts by the building community been so slow? How do you see these themes developing into the future? Ken Yeang. I am not sure why our concepts and ideas on green design have been slow to gain traction by the building industry and by our community of professionals. It may be because public adoption of new ideas first require champions by important figures like politicians and leaders in the profession and industry. I started work in this field in 1971—it was the topic of my PhD dissertation at Cambridge. It took a while for leading politicians and professionals and others in the building industry to champion sustainable design, probably around the late 1990's. Sustainable issues are essentially ethical issues and because these do not have immediate commercial impacts, often no action is taken until a disaster brings them to the forefront. With regard to how I see these themes developing in the future, my view is that green design is still in its infancy. There is there is still so much more to be done and this will continue to progress in the future. There is much more theoretical, technical and design interpretation work to be accomplished. For instance with bioclimatic design, there are many bioclimatic systems for different climatic zones that need to be developed and tested (e.g. evaporative cooling systems at non-commonly adopted climatic zones, work to advance the technology of the Trombe walls, low-energy flue-wall or flue-atrium type of natural ventilation systems, climate-responsive facades responding to different seasons of the year and at different climatic zones, etc.) With green walls, many of the current systems are essentially hydroponic systems. We need self-sustaining green wall systems that are not hydroponic, and green wall systems that enable a greater range of native species to be used. With vertical gardens, we need advancement of systems of vertical integration. We need to find ways to bring daylight to the vegetation at the inner depths of vertical gardens. Finally we need to design vertical gardens that can survive through all seasons of the year especially in cold and temperate climates, and devices to enable them to withstand high wind speeds at the upper parts of buildings, etc. Further studies need to be done on skycourt typologies, further studies on how these can be better integrated with vertical landscaping and sky-parks while maintaining an ecological nexus with the landscape at the ground plane. We also need studies on how these as public 'places-in-the-sky' can be beneficial and integral with the social lives of high–rise inhabitants, etc. “Biomimicry” is of less interest to me whereas I regard “ecomimicry,” where design imitates the properties and attributes of ecosystems to be more relevant to green design. I did research work on biomimicry in 1972 when I wrote a number of papers (published in AD and in AAQ [Architectural Association Quarterly] on 'bionics' and on the use of biological analogies for design. These led me to conclude that for ecological design, ecomimicry is more directly relevant to green design than biomimicry. While LEED has encouraged and enabled many professionals to be involved with green design and had been immensely successful in proselytizing green design to a wide public audience, it is an incomplete system and not environmentally comprehensive. What differentiates our work from other green architects is its authentic ecological basis for design. This is more relevant as it is fundamentally premised on ecology and environmental biology. We see this as the focus of the next generation of green design. MP: The bioclimatic skyscraper is a compelling notion for a sustainable tall building, yet many feel that, while tall buildings may facilitate density, they are a fundamentally unsustainable building type. Do you feel, for example, that net-zero operational energy performance of a tall building is practically achievable on a widespread basis? KY: It is necessary to appreciate that “bioclimatic design'”is essentially “passive-mode low energy design” and “mixed-mode low energy design.” “Passive-mode low energy design” is designing (eg. built form configuration, facade design for solar protection, use of bioclimatic devices,etc.) to respond to the climatic conditions of the site while optimizing the ambient energies of the locality to result in a built form that is passively low energy without the use of any mechanical and electrical systems. Whereas “mixed-mode low energy design” is designing in relation to the climate of the site optimizing the ambient energies of the locality to result in a built form that has a partial use of M&E systems. Bioclimatic design is only the first step in ecological design. It is a subset of ecological design, and provides the basic armature for ecodesign, following which other aspects of ecological design can be incorporated holistically with the built form. In this regard, the 'bioclimatic skyscraper' is not a sustainable design per se but only a partially sustainable design, where other aspects of sustainable design (e.g. water management, carbon neutrality, biodiversity, etc.) need to be subsequently taken into account. Yes, most tall buildings are fundamentally unsustainable buildings unless located over transportation hubs. This is because the tall building utilizes around 30% or more energy, materials and engineering systems to build, operate, reuse, recycle and to demolish. We should not build tall unless we have to. My rationale for looking into this building type is that the tall building type is a builtform that will not go away overnight. It exists for many prevailing urban and land economic reasons. If this built form shall be with us for a while, my contention is that we should not negate them but on the contrary seek to find ways to make them more humane to inhabit and find ways to make them as green as possible. If all the green designers of the world negate this built form, then who will make them as green or pleasurable to inhabit as possible? The net-zero operational energy performance of a tall building can in principle be practically achievable but it will be dependent upon the level of internal comfort conditions acceptable to dwellers. MP: Do your theories of eco-architecture and bioclimatic design translate easily to climatic zones outside of the tropics? What would a bioclimatic skyscraper look like in San Francisco? KY: What an odd question? Certainly the theories of eco-architecture and bioclimatic design are generic and are applicable to all climatic zones—not just in the tropics. However we must be clear that ecoarchitecture and bioclimatic solutions are site specific. What is effective for one locality and for that latitude, climate conditions and local ecology cannot be applicable to other latitudes, other climatic conditions and other local ecological conditions. Nevertheless, the principles (being generic) of ecoarchitecture and the principles of bioclimatic (as a building science basis for architectural design) remain applicable to any climatic and ecological locality of the planet. What will differ are the design responses to the different climatic conditions. However the design interpretation and application of these principles for each location (latitude and climatic conditions) will be different. To your question, “What would a bioclimatic skyscraper look like in San Francisco?,” the answer is that it will look totally different from a bioclimatic skyscraper in the tropics. Most likely a bioclimatic skyscraper in San Francisco will have a variable facade that will enable it to be operable for different seasons of the year. Likely we can make us of the “natural buoyancy” in the San Francisco climate in the mid season spring and autumn) as a “flue façade wall” or “flue atrium” for natural ventilation to create a low energy built form or atrium. These can create a totally different aesthetic for a San Francisco bioclimatic skyscraper than a bioclimatic skyscraper in the tropics. MP: Are there emerging building materials or technology that your are excited about, the hold the potential to facilitate the transformation of the built environment toward a sustainable future? KY: Yes, there are many emerging building materials or technologies that are exciting that hold great potential to facilitate the transformation of the built environment toward a sustainable future—such as the use of nanotechnologies in materials and facade coatings, in future PV cells that imitate photosynthesis, in use of “cloud computing” in building automation systems, in climate responsive façade systems, in low energy carbon neutral environmental systems, etc. At the AIA’s National Convention in Denver, held from June 19–22, AN’s Emily Hooper sat down with Spanish architect Francisco Mangado, who was in attendance to receive an honorary fellowship. Mangado discussed foreboding amendments to Spain’s law of professional services that would allow engineers, or anyone deemed “competent” in construction, to design and erect buildings across the nation. The law was introduced at a council meeting of Government Ministers in April of 2013, and a final pass-or-fail decision will be reached by the end of this year. Mangado: At the moment, we are very concerned about this. There are important demonstrations in Spain against this amendment because the government wants to change the law and allow engineers to do buildings. Right now, only the architect has the capacity to design and build buildings. But now the government, in a very very wrong way I think, [has proposed this and] there is no correspondence with the kind of training of architects and engineers receive in school, to extend the possibility to design and make architecture. Of course we are complaining, not only for a professional questioning, but for cultural and conceptual consideration. Architecture is not only construction. It has to do with the city, with the values of the citizen, with the public space, with beauty, with historical and symbolic concepts, but engineers don't manage these. In the same way that I'm not prepared to make a bridge, I think the government has to realize engineers aren't prepared to design buildings. Right now we are organizing a lot of complaints. After the summer I think the country’s students of architecture will go out to the streets to demonstrate and defend the profession, even with very violent demonstrations because it’s the only way our government will understand these things. We have a government that’s a disaster. The crisis is terrible but this government is increasing that crisis. So the problem of Spain is not only this government; the former government—of socialism—was another disaster. And the conservatives are just another. So the problem of Spain is our politicians. We have a very intelligent country of people who are well prepared with the capacity to work but we have a cancer—which is called politicians. They don’t accept anything. They don’t understand anything. I studied economic science before studying architecture; I know what it means to make an economy. An economy is a very important political component. Economy doesn’t mean you manage a society as if we were just a number in a computer. It’s much more. What is happening with architecture is just another sign of how wrong they are. But we have confidence in the citizens that we will defend our position. 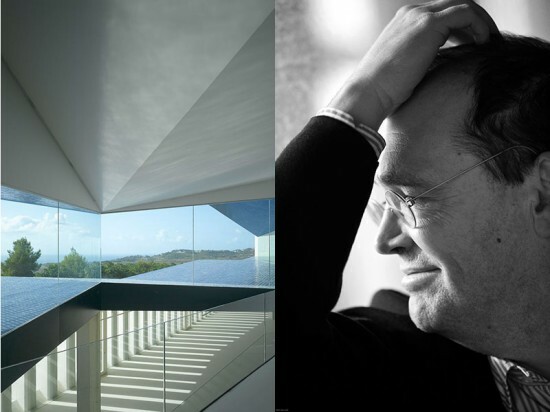 My family created an architecture and society foundation that at the moment is considered the most important architecture institution in Spain. Because the social architectural association went bankrupt from the crisis, our association has assumed the role of organizing conferences, lectures, and defending architecture in this sense against the government. If it’s necessary to be in the street, with protest, with violence, we will be there defending architecture. AN: So, this law is an economic measure. Mangado: Exactly. They are making this because they think they are going to reevaluate the cost for doing architecture. The reasoning is the more people they have doing architecture, the less the fees. But it’s completely wrong. At the moment in Spain, there are 40,000 architects and another 40,000 students of architecture, waiting to become architects. With this enormous amount of architects they already have competition. Architecture is a relationship with society. We are making buildings to serve a society, so architects have to be keen on these kinds of questions. What also happened is the government has made the most of the academic schedule in order to prepare this law because they know that 40,000 students are on vacation and they know if these students were at university now, tomorrow they’d have 40,000 young people on the streets. 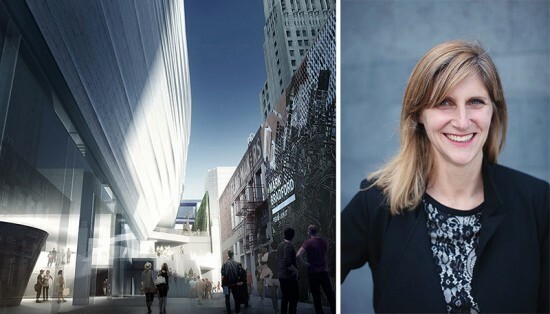 Jennifer Dunlop Fletcher was recently named the head of the department of architecture and design at the San Francisco Museum of Modern Art (SFMOMA), filling a position vacated by Henry Urbach more than two years ago. Fletcher just completed a assessment of the museum’s architecture and design collection, and, most recently, she co-curated the exhibition Lebbeus Woods, Architect. She sat down with AN editors Nicole Anderson and Alan G. Brake to discuss her plans for the department. The Architect’s Newspaper: What direction do you plan to take the architecture and design department? 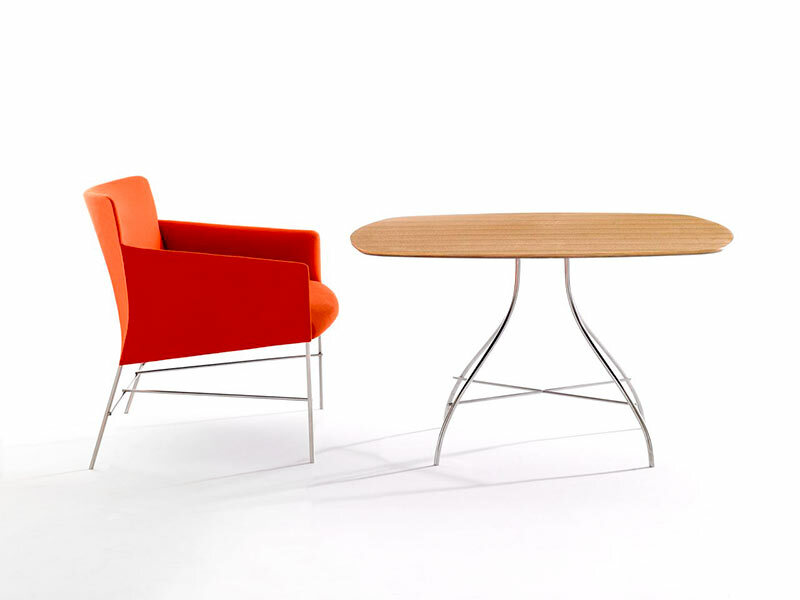 Jennifer Dunlop Fletcher: The collection just turned 25 and so I think it was important that my colleague Joseph Becker and I, along with Henry Urbach, really undertook a collection analysis and are trying to draw on the identity and strengths of the collection: the experimental and conceptual architecture, the iconic chairs that capture every 20th century design movement, and then the Bay Area collection. We’ll definitely continue with focusing in those areas, and in this interim period, spend some time drilling down on some connections between the two like Bay Area experimental architecture like Ant Farm and some of the architects coming out of California. Thanks to Aaron Betsky we happen to have some great early drawings by Morphosis and Thom Mayne, and Neil Denari and want to revisit those moments. We’ve definitely been in dialogue with those guys. Also through this Lebbeus Woods show, kind of looking back at that moment around the founding of the Storefront for Art and Architecture. That seems a little under collected and something that because of the architecture department coming around in the late 80s, it is what Aaron and a lot of people were very interested in. We want to explore product design, but produce design where it merges with technology because of our obviously being embedded right there in the Bay Area. And it is infiltrating every field. You see it even in the graphic design and the architecture, with responsive buildings. 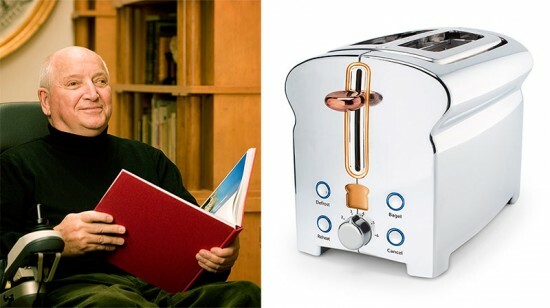 I think just what we want to do with product design is not just collect it, but probably take the time working with our conservation department and interpretation department to figure out how to not just maintain it and upgrade it, but how to display it. Because all of a sudden, the moment of just displaying the hardware, the iPhone just as hardware, has passed. 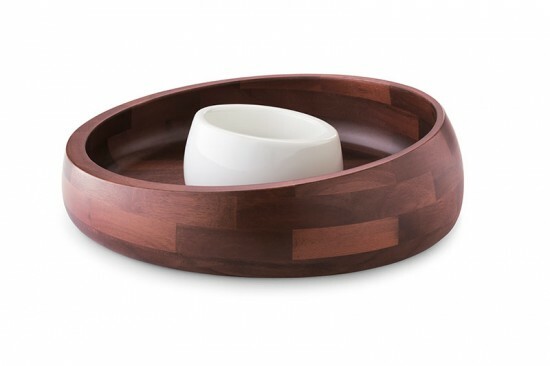 Any specific ideas about how you will display the product design? We haven’t landed on any clear avenue to take yet because we also recognize within product design there is the extra challenge of how to deal with a commercial product. Film or these kinds of media that we’re used to, marketing departments already use. And it is very expensive to invest in yet another film. Maybe in 20 years from now, the marketing itself will be kind of interesting. It is a challenging question given the rate that technology is developing and changing. How do you evaluate what is going be influential? It seems that we as even as museum professionals and media are so quick to identify something that could potentially be a game changer. I feel like at the museum we really need to take the time to say why is this culturally relevant? And interpret it in that context. There is also a side of me that says the museum—this holder of objects—and maybe we’re already moving towards no objects. Maybe we should not even be trying to go in that direction. If we are beholden to our 5000 objects that we already have—we may land on this might not be appropriate for us to pursue because we have this building and this collection and it would be abandoning this past. I don’t know, but this is what is exciting to me—what lies ahead. And in the meantime while the building the expansion is being completed, are you working on any with other cultural organizations collaborations outside of the museum? We are part of this project in Los Altos in the middle of Silicon Valley. It is the neighbor city to Palo Alto. It is also one of the wealthiest cities, wealthier than Beverly Hills. Downtown has State and Main Streets—so it’s a classic American city and there are a number of empty storefronts, so the city invited the museum to occupy temporarily these storefronts in order to show some works of art that dealt with the context of Silicon Valley. I am already working with Mike Mills, the filmmaker and graphic designer. He has done a couple of videos and films on suburbia and identity. He has proposed a piece that deals with the past but starting in 1976, the moment when the first Apple computer was built in a garage there in Los Altos, to the present and then the future. He has proposed interviewing children of employees of some of the tech companies and asking them about the future—what would you design for the future? It is a little revisiting Buckminster Fuller when he invited children to ask him about the world and the future. Is there anything you’re particularly excited about in terms of using the new building? We have a set architecture and design gallery which we have always had in the existing building, but also we will have more opportunities to use the larger temporary exhibition space on the 4th floor to do larger exhibitions that would travel. And be more collegial with peer institutions. Really get the SFMOMA collection in conversation with other collections and share the scholarship. Also at the same time, accept exhibitions. We have affinities with the FRAC and the Pompidou with the experimental architecture and our interest in product design relates to MoMA. Look at LACMA and their California emphasis and our Northern California emphasis. I am not really ready to talk about this other proposal we have in the city—because we really want to do something that is not in the gallery at all but in the city. In your analysis of the collection, were there any happy discoveries that you weren’t aware of or things that struck you in a new way? I think looking at the kind of beginning why every curator has continued this strand of conceptual architecture and where Paolo Polledri was the first A&D curator—really looking locally and inviting architects to address the Bay area. Aaron Betsky was sort of voraciously looking outside the Bay area and seeing this moment in Los Angeles and in New York happen. So looking at that strand of where I think Paolo called it visionary and Aaron was calling it conceptual and Joe Rosa was calling it un-built works. Can you comment on at all where you see the architecture scene in the Bay Area today? There seems to be a lot of built work happening. There is a lot of built work happening. There is a lot of repurposing happening. We are going to be right next to the new Yelp headquarters, which is in the Timothy Pflueger building from 1927. Particularly in the Bay Area because a lot of the practitioners have access to tech companies and robotics that responsive architecture is emerging here—which we are so well positioned to look at with our interest in technology—architecture that is not just fabricated in a new method but responds to occupancy and climate. And also recognizing that these were early hopes from architects of the 1960s. This kind of Ant Farm movement, but ok now we know what technology can do. Is there anything else you would like to comment on? I don’t want to ignore our iconic chair collection. Along with our look at how to display product design. I think we’re also thinking will this trickle down into the pre-software products. We have all recognized that when you put a chair on display in a museum, you’re taking away its function. But maybe what we learn from how to display software maybe that would inform how we might display a chair. 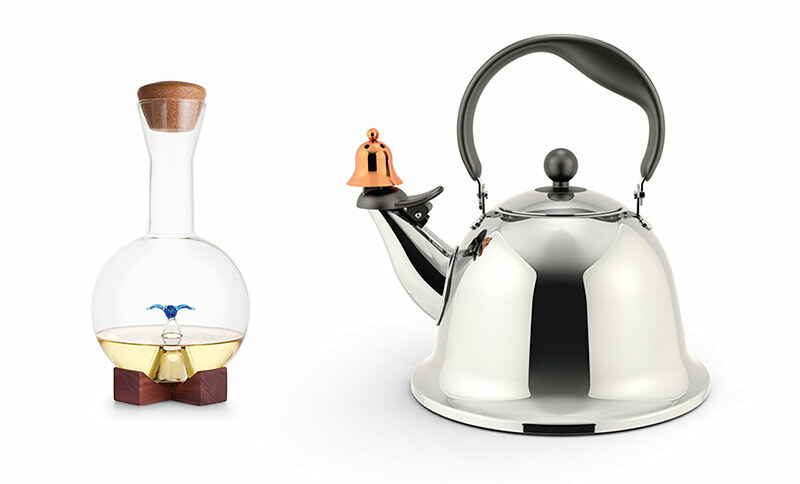 At J.C. Penney’s recent rebranding launch party, AN spoke with architect and product designer Michael Graves about his new collection for the company and some career highlights. He even offers advice for aspiring architects and designers and talks about some current design work. How did designing a collection for JCPenney come about? I’ve known some of the people at Penney’s since my Target days, so when this opportunity came around we were looking for a way to slow down our commitment to Target at that time. When Penney’s offered what they did to us, we grabbed it in a second. It was such a good deal in terms of having a shop within a store. For me, that’s the game changer. If we were close friends and you told me you had to do some shopping for a relative or something like that, I’d tell you to go to our shop in Penney’s. It’s all there and that’s what excites me. What was your favorite part about designing the collection? Designing the collection. Any challenges you faced with it? Every day you face a challenge; with the materials you’re using, price point, function, appearance. All of that comes together in the quest for good design. But it was wonderful to get to do it and so much fun. People think it’s a struggle and hard work and all of that—and it is—but that’s what’s so gratifying about it is to get to do those things and to make “stuff.” If you had to name a single success of your career thus far, what would it be? That’s a very difficult thing [to answer] because there’s the practice of architecture, there’s the practice and business of product design, there’s health design—which is something we’re engaged in now—there was teaching. But Paul Goldberger or somebody said, “Michael would ultimately be known for the office he made, the people that he produced, the people that came to work at the office then go run a school of architecture somewhere, or when he was teaching how he taught them.” But it’s so hard to say one [element] is worth more than the other because I’ve never thought that way of “what’s the best thing I did,” or “who is my favorite child.” I have a favorite child on given days but designing this [collection] is right up there with everything. To get to open these shops all across the country now and to see what you all say about it will be interesting, as well, because that will really tell us how it’s doing. We will live and die, to some extent, by the consumer’s reaction [to our products]. Penney’s won’t keep it if it doesn’t sell but I think it will do well. Do you have any advice to offer aspiring architects or designers? Yes, two things: read, read, read, and draw, draw, draw. You can’t draw enough. While talking to the new dean of the school of architecture at Princeton, I told him, “I have to draw everyday just like a pianist would have practice the piano everyday.” You have to draw everyday: Once you know how, you can’t suddenly give it up. It’s the same thing with designing. I hate days that I don’t get to work on a building. I go home and I’m in a little bit of a funk because I didn’t get to do my craft that day. I had to give an interview, or talk to students, or talk to a client—all of it interesting. But the thing about my life is that I wouldn’t change it for anything. What excites you about the future of design? What we’re involved in is very exciting and now, especially with healthcare design, we’re really pleased with what’s going on. We’re doing a new hospital in Omaha, Nebraska and I’m so pleased with it. It’s a rehab center and it caters to the whole family, but there are a lot of kids there and kids need their parents. So, when young patients are in the hospital for weeks, at least, we have a place for one or the other of their parents to stay there as well. It’s not just a chair that turns into a bed but a real, little cubbyhole of a room. It’s the first time in hospital design that’s been done. It doesn’t sound like much, but it’s going to be a game changer. Patrizia Moroso, art director at Moroso, recently chatted with AN about her impressions of ICFF, working with Patricia Urquiola, and the design house's plans for New York Design Week. 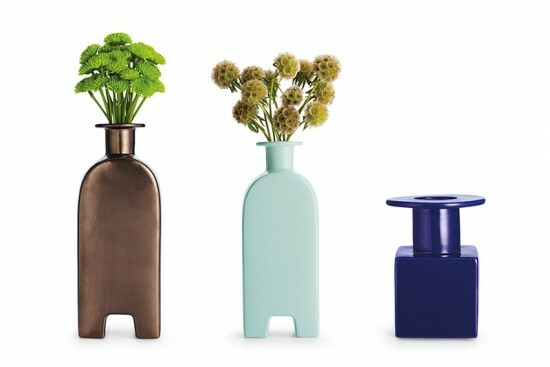 What are your impressions of ICFF? It is something very important for the U.S. and for New York. For me, around the fair and outside the pavilions, there's a lot organized in town. The fair is growing. For example, Milan [Furniture Fair] has become so important these years. In Milano, we have something like 3,000 events around design week but this means that people are excited. Now, New York is becoming something like this. You have so much happening around it. The interest and the dialogue between the institutions and the companies and firms can carry on in and around the fair. What is Moroso doing for ICFF? It takes place one month after Milano, so we usually present a few of those releases, [since] that is the big show for us. It's natural to present what we've done in Milano but with another special twist. This year we're transforming the space for Patricia [Urquiola] and in the window [overlooking Greene Street] we're showing the things we've done for Patricia and Kvadrat. We were talking months before the fair so we decided to do something together. Fabric is great for upholstery and we have an installation that was amazing for me. We won an important award in Milano and are happy to say we were the winners this year, so we can show just a glimpse of that here in New York. Because the installation was so big—it took 10 days to install in the [Milan] space—it was not easy to reproduce. Some [challenges were] material, some immaterial. But the exhibition we had [there] was not possible to reproduce here. 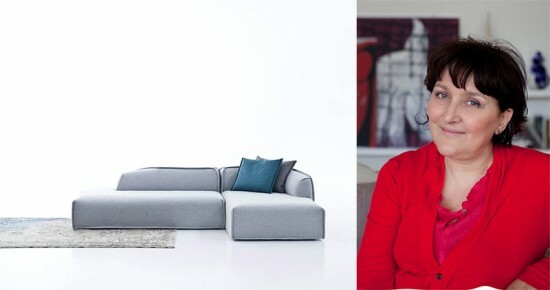 How did you start working with Patricia Urquiola? About 14 years ago, she was just starting in the design profession. She was managing projects in another big studio in Milano but her name wasn't attached [to her work], as it happens a lot with young designers. A common friend called me to tell me about her; "She's a young designer who's ready to tell her own story. I think you'll be perfect match." I saw her work and energy, and we started working together [pretty much] right away. We are good friends and work together a lot. We are sharing many things, even outside of our profession. Our lives are very intertwined. Is there anything special about showing in New York? The mood here is very happy and bright. It's spring here, [so with the] flowers [in the window] we're trying to recreate that feeling. We painted the showroom in all bright colors, just like space in Milano and we are carrying a mood that we started in Italy. What you see in the window are prototypes that we are presenting but are not yet in production. These are really new things. For example, we are showing our new sofa system, MASSAS, an acronym for Moroso Asymmetric Sofa System Adorably Stitched. Its massive and delicate at once: it's not a common piece of furniture. The other things we will present is our new fabric collection in new colors. Everything is coordinated with the new colors and flowers because the collection is happy. It's not feminine but the approach is very sweet. We want to be optimistic and joyful. For us, it's a new style. What is your favorite thing about coming to New York? The energy, the air—it sparkles! You can come on a rainy day but the morning after everything twinkles. There's something about it. You walk the streets and you're happy. The air in your face is sweet; maybe it's the ocean? The light? It's the atmosphere. If you sit at a cafe and see the people walking, you can see the planet in an hour. You see all the nations here. That, for me, is incredible. When you put all the different people together you have a fantastic melting pot here in the city. It's the power of humanity. I really hope to work more in a country like this, that I love so much. The possibilities here are grand. I really like the thinking here. I meet a lot of architects and designers and everyone is so special. Things are moving fast, projects are growing, it's all very interesting. There's lots of energy in terms of thinking, too. It's all very positive and fast paced.